Ghost Bath are looking to release the final part of their album trilogy next year. They launched Funeral in 2014 and followed that with Moonlover last year – before signing with Nuclear Blast. And following the band’s 2016 touring commitments, the group’s Nameless reveals they’ll return to the studio later this year to finish their third album. Speaking to TeamRock after their appearance at the UK’s Bloodstock festival earlier today (Sunday), he says: “After this we do a couple more shows with The Black Dahlia Murder and Dying Fetus and then we have about two weeks of shows around Europe. 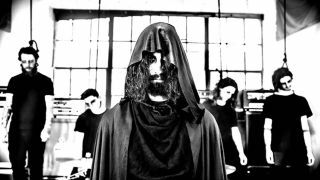 Ghost Bath formed in 2012, and quickly rose to fame as an example of Chinese black and extreme metal – but they received a significant amount of backlash when it turned out that they were actually from the US. The full interview with Nameless will feature on an upcoming episode of the Metal Hammer: In Residence podcast on Spotify.